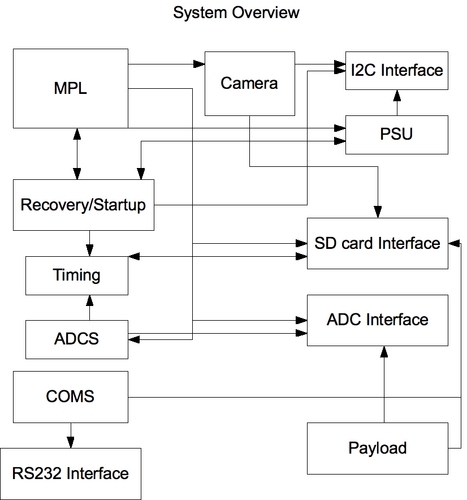 The data processing and command subsystem is extremely important to any satellite since without this component the other areas of the satellite would not be able to interface with each other and there would be no way to download or upload data to and from the satellite. In addition to this, a separate development board is supplied, designed for testing software and interfaces on the ground. The CPU is an MSP430 F1612, a 16-bit RISC processor running at 7.4MHz during normal operation. The processor executes a single instruction per clock cycle, so its performance in MIPS is equal to its clock speed. The processor has a number of modes of operation that balance power and processing requirements, all drawing 250μA per 1 MIPS. It should be noted that, unlike most desktop processors, this CPU does not have a hardware floating point unit. Non-integer calculations will have to be implemented in software as either floating point (very slow) or fixed point (faster, but limited range of calculations). It is unknown at this time the potential floating/fixed point performance of the device, but in any case the MIPS rating should in no way be taken to indicate FLOPS. The OBDH module has 50Kb of flash memory and 5Kb of RAM sharing the same 64Kb address space. The board has a Von Neumann architecture so can execute programs directly from either flash or RAM. The flash memory is able to be rewritten by the board without external power. For most applications, code will be executed from flash and use the RAM as working memory. Extra storage is to be supplied by a 2GB Smart Modular Technology SD memory card. This capacity has been chosen as it the largest size that can be interfaced with the FM430 board and all different capacity disks have approximately the same mass, volume and power requirements. The SD card will hold scientific data from the payload as well as pictures taken by the camera before download by the ground station. At full speed, the entire Flight Module should consume no more than 20mA @ +3.3V (66mW). By taking advantage of the MSP430's power-saving design and the event-driven Salvo RTOS, the average current should drop to well below 1mA (3.3mW). The temperature range at which the board can operate is -40°C to +85°C. The SD card has the same range, and can be stored between -65°C and 150°C. The radiation hardness of the electronic elements is not specifically known, however the flight module has been space approved and has been used previously by other CubeSat projects therefore we do not foresee any problems with it. The environmental tolerance of the SD card is covered on its own page. The board features two 52-pin bus connectors, designated H1 and H2, to handle most interfacing. The pin assignments for the bus can be found here.